17.11.08 The Chairman of Vandea State Parliament of France, member of European Parliament Philip de Williet, and the delegation chaired by him, visited Tsitsernakaberd Memorial Complex. Mr. Williet put flowers at the memorial of the Armenian Genocide victims and planted a fir at the Memory Alley. The Chairman of Vandea and the delegation took a tour of the Armenian Genocide Museum, where Mr. Williet left a note in the Commemoration Book. 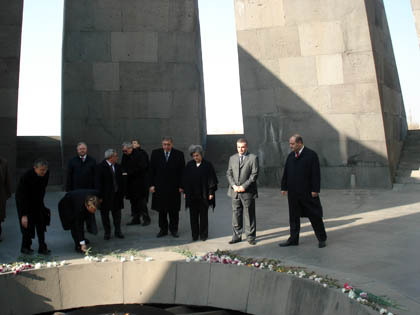 17.11.08 Hungarian Foreign Minister Mrs. Kinga Goncz visited Tsitsernakaberd Memorial Complex. Mrs. Goncz put flowers at the memorial of the Armenian Genocide victims and took a tour of the Armenian Genocide Museum, where Mrs. Goncz left a note in the Commemoration Book. 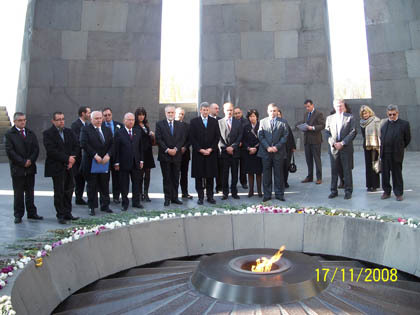 12.11.08 Chairman of the Cyprian House of Representatives Marios Garoyan visited Tsitsernakaberd Memorial Complex. 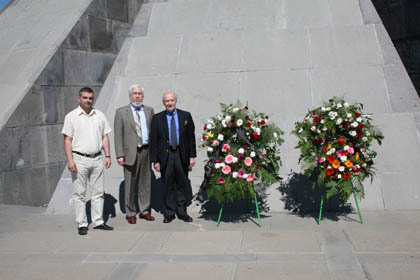 Mr. Garoyan put a wreath at the memorial of the Armenian Genocide. Then the Chairman of the Cyprian House of Representatives and the delegation took a tour of the Armenian Genocide Museum, where Mr. Garoyan left a note in the Commemoration Book. 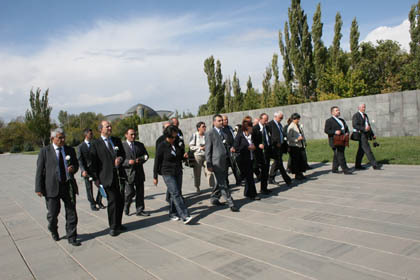 23.10.08 The participants of session of council of heads of security bodies of CIS counties visited Tsitsernakaberd Memorial Complex. The guests put flowers at the memorial of the Armenian Genocide and also visited the Armenian Genocide Museum. 21.10.08 The president of Russian Federation Dmitri Medvedev arrived to Yerevan on an official visit. 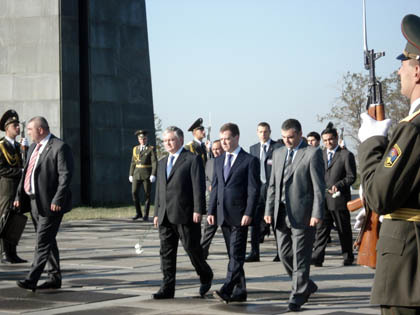 The president of RF visited Tsitsernakaberd Memorial Complex. Mr. Medvedev put flowers at the memorial of the Armenian Genocide victims and planted a fir at the Memory Alley. Then the president and the Russian delegation took a tour of the Armenian Genocide Museum, where Mr. President left a note in the Commemoration Book: вЂњArmenian Genocide Museum and memorial are the evidences of awful tragedy of 20th century. In the same time it reminds that life is the most important value that given for safe to civilized nationsвЂќ. 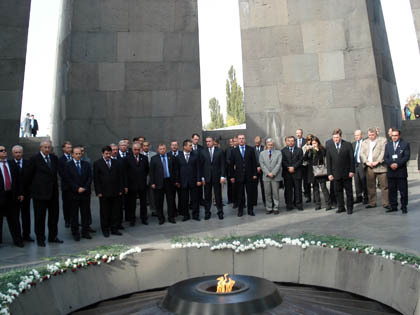 09.10.08 Members of the Switzerland-Armenia parliamentary group of the Federal Assembly of the Swiss Confederation headed by Christine Egerszegi-Obrist visited and paid tribute to the memory of the Armenian Genocide victims at Tsitsernakaberd. 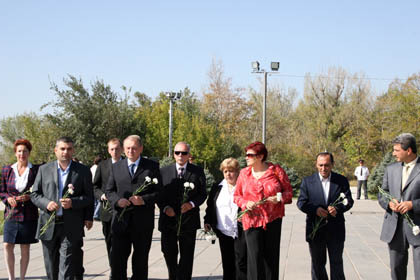 07.10.08 The delegation of constitutional and legal affairs commission of the Czech parliament headed by the chairman of Chamber of Members of Parliamnet Yan Kasal visited the Tsisernakaberd Memorial Complex. 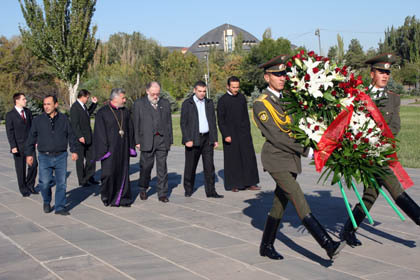 The guests put a wreath at the memorial of the Armenian Genocide and also visited the Armenian Genocide Museum. 02.10.08 The president of the Constitutional Court of the republic of Latvia GunДЃrs KЕ«tris, visited Tsitsernakaberd Memorial Complex. The guests put flowers at the memorial of the Armenian Genocide and also took a tour of the Armenian Genocide Museum. 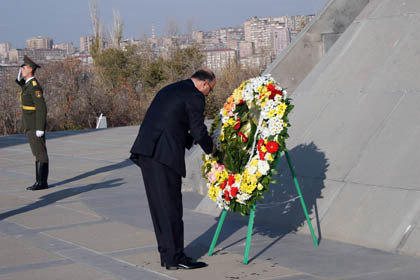 02.10.08 The chair of the Central Election Commission of RF, Mr. Vladimir Churov visited Tsitsernakaberd Memorial Complex. The guests put a wreath at the memorial of the Armenian Genocide and also visited the Armenian Genocide Museum. Mr. Churov left a note in the Commemoration Book. 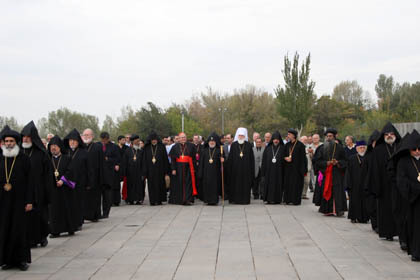 27.09.08 Catholicos Garegin II and the representatives of the Christian churches who have arrived at the Holy See for the holiday of blessing of the chrism held a ceremony of commemoration in Tsitsernakaberd, at the memorial of the Armenian Genocide. The representatives of the delegation put flowers at the memorial of the Armenian Genocide and also visited the Armenian Genocide Museum. 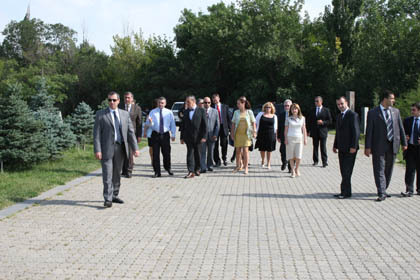 26.09.08 The delegation, headed by the minister of culture of Slovakia Marek Madyarich, visited Tsitsernakaberd Memorial Complex. 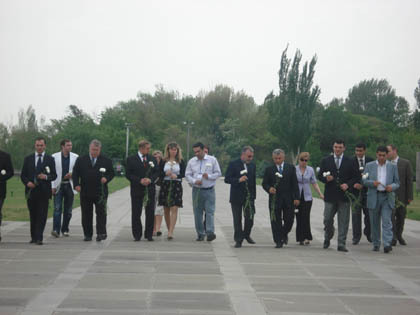 The Guests put flowers at the memorial of the Armenian Genocide and also visited the Armenian Genocide Museum. Mr. Madyarich left a note in the Commemoration Book. 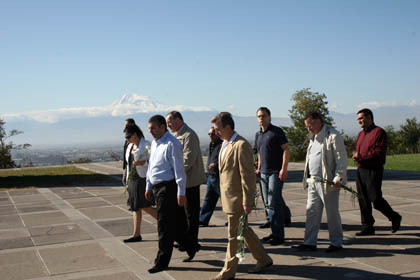 24.09.08 The delegation of the Collective Security Treaty Organization (CSTO) visited Tsitsernakaberd Memorial Complex. The Guests put flowers at the memorial of the Armenian Genocide and also visited the Armenian Genocide Museum. 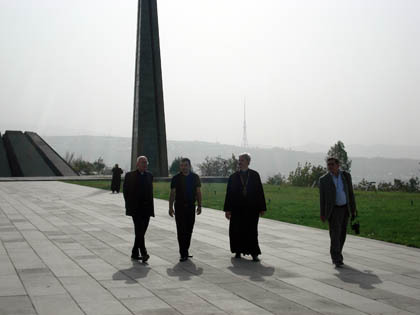 13.09.08 The delegation headed by the chairman of the Czech Senate Prshemisl Sobodka visited Tsitsernakaberd Memorial Complex. The Guests put a wreath at the memorial of the Armenian Genocide and also visited the Armenian Genocide Museum. Mr. Banting left writing in the Commemoration Book. 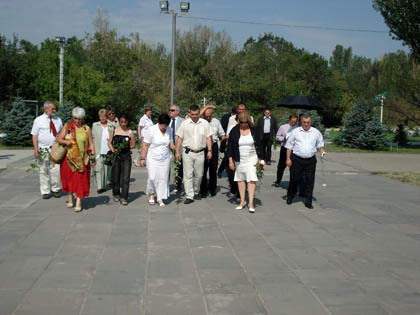 26.07.08 The representatives of the local government of 18th district of Budapest and Armenian self-government of 18th district by the head of the deputy of the National Assembly of Hungary, the mayor of the 18th district doctor Laslo Meshter visited Tsitsernakaberd Memorial Complex. Guests put flowers at the memorial of the Armenian Genocide victims and planted a fir at the Memory Alley. They also took a tour of the Armenian Genocide Museum. Mr. Meshter left a note in the Commemoration Book. 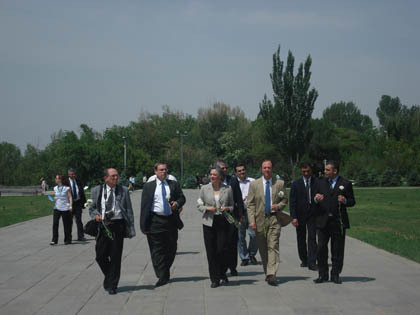 11.07.08 The Cassation Court of RA and the delegates of High Judicial Instances of Friendly States visited Tsitsernakaberd Memorial Complex. The Guests put a wreath at the memorial of the Armenian Genocide and took a tour of the Armenian Genocide Museum. Representatives of the delegation also planted a fir at the Memory Alley in the memory of the Genocide victims and left a note in the Commemoration Book. 06.07.08 The Minister of Foreign Affairs of the Czech Republic Karel Schwarzenberg, accompanied by the representatives of the Ministry of Foreign Affairs of RA, visited Tsitsernakaberd Memorial Complex. Guests put wreath to the memorial of the Armenian Genocide victims and planted a fir at the Memory Alley. 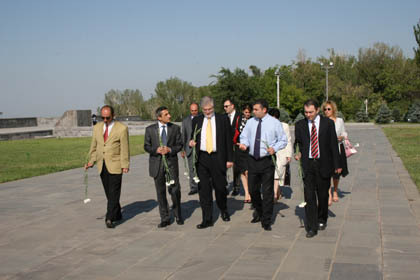 30.05.08 The representative of the Jewish Committee of America, ambassador Peter Rosenblatt, and Ross Vartian, the executive director of the American-Armenian Public Affairs Committee accompanied by Madlene Minassian, the executive director of Hope for Armenia Found, visited Tsisernakaberd Memorial Complex. Guests put wreaths to the memorial of the Armenian Genocide victims and visited the Armenian Genocide Museum. 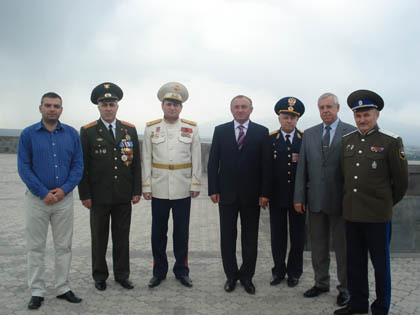 27.05.08 The delegation headed by the Ex-Defense Minister of the Russian Federation Pavel Grachov visited Tsitsernakaberd Memorial Complex. The guests put a wreath at the memorial of the Armenian Genocide victims and followed their visit by taking a tour of the Museum and leaving a note in the Commemoration Book. 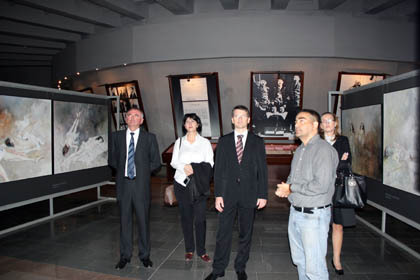 26.05.08 The Deputy Prime Minister and Minister of Justice of Slovakia Stafan Harabin visited Tsitsernakaberd Memorial Complex. 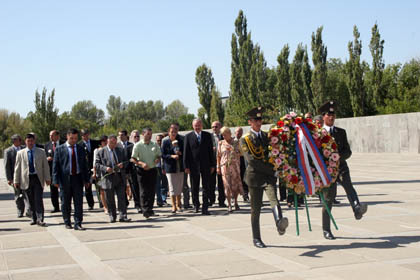 The guests put a wreath at the memorial of the Armenian Genocide victims. Mr. Harabin, accompanied by the deputy director of the AGMI Suren Manukyan, visited the Armenian Genocide Museum, where Mr. Manukyan introduced him to the history of the Armenian Genocide. Mr. Harabin left a note in the Commemoration Book. 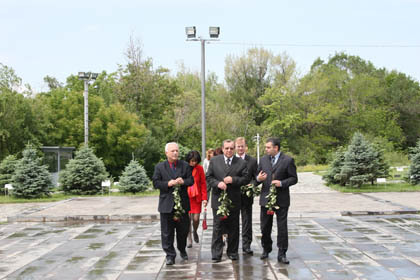 21.05.2008 The Cultural Minister of Belarus Vladimir Feodorovich Matvichuk, visited Tsitsernakaberd Memorial Complex. 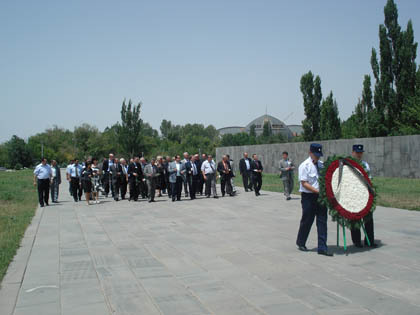 The guests put a wreath at the memorial of the Armenian Genocide victims. Moreover, Mr. Matvichuk, visited the Armenian Genocide Museum, where Mr. Demoyan introduced him with the history of the Armenian Genocide. Mr. Matvichuk left a note in the Commemoration Book and expressed his best wishes to the Armenian nation. 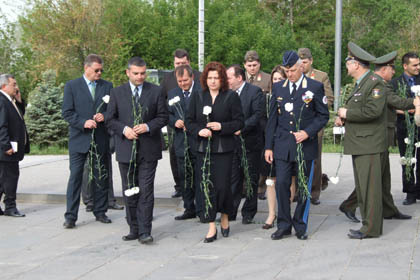 25.04.2008 The vice Minister of Defense of Hungary Mrs. Agnesh Vadda, visited Tsitsernakaberd Memorial Complex. The guests put a wreath to the memorial of the Armenian Genocide victims. Mrs. Agnesh Vadda, accompanied by the Director of the AGMI Hayk Demoyan, took a tour of the Armenian Genocide Museum. 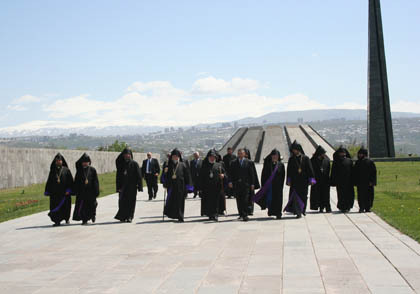 21.04.2008 His Holiness Karekin II, Catholicos of All Armenians and Aram I Catholicos of the Great House of Cilicia visited Tsitsernakaberd Memorial Complex. 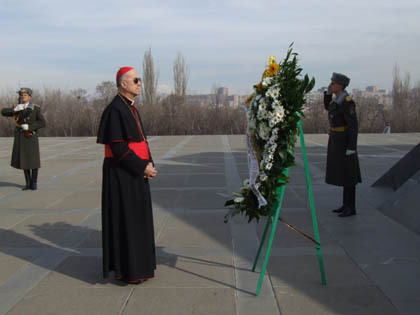 During the visit, His Holiness put a wreath at the memorial and served a religious ceremony in memory of the victims of the Armenian Genocide. 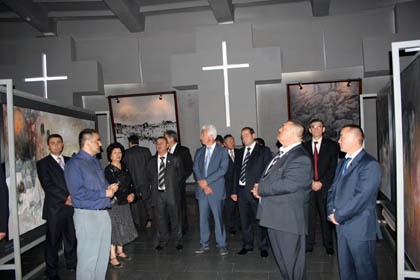 They also visited the Armenian Genocide Museum, where the Director of the AGMI Hayk Demoyan, introduced them to the new photos added to the collection of the museum exhibit. 06.02.2008 The Russian Prime Minister Viktor Zubkov is embarking on a two-day official visit to Armenia. Mr. Zubkov accompanied by the Mayor of Yerevan Yervand Zakharyan and the Deputy Foreign Minister of RA Gegham Gharibjanyan visited Tsitsernakaberd Memorial Complex. During the visit, the guests put a wreath to the memorial of the Armenian Genocide victims, while the Prime Minister planted a fir at the Memory Alley. Accompanied by the Director of the AGMI Hayk Demoyan, Mr. Zubkov walked about the memorial, familiarizing himself with the details of the first genocide of the 20th century. 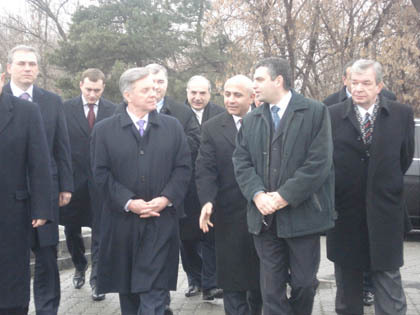 30.01.2008 The governor of the Moscow region Boris Gromov, accompanied by the Deputy Prime Minister and the Minister of Regional Administration of the RA Hovik Abrahamyan, visited the Tsisernakaberd Memorial Complex. 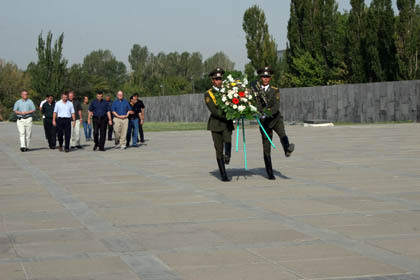 During the visit guests put a wreath to the memorial to the Armenian Genocide victims.